Did you know that you could just walk into your local Starbucks and request a "Green Apron Book", that outlines the principles of Starbucks? I heard about this little booklet from a recent book I had read about the company and went in to my local Starbucks and asked for a copy. I was a tad surprised when the employees were extremely happy to give one to me. There’s something to be said about a company that is not afraid to share their core principles with their customers. There’s much more to say when they do it so enthusiastically. I was totally impressed with being able to walk into my local Starbucks and get a copy of their “Green Apron book” after reading The Starbucks Experience: 5 Principles for Turning Ordinary Into Extraordinary. After reading it that afternoon, what impressed me the most was the absence of rules. In their place were suggestions, goals, and the empowerment to make every customer’s experience a memorable one. It was at that moment that I realized the significance of Starbucks’ philosophy—not only for business, but for life in general. One thing that comes out fairly strong in most of the books I read about Starbucks (and Toyota as of late) is the acknowledgment of senior managements importance in setting the culture, ideals, and principles of the overall business while giving the “people doing the work” the ability to act within the framework of the principles. Get to know your customer by drink or name. This completely impressed me – because I experienced it. As a matter of fact, it impressed me so much that I wrote about the experience in the post “ Reaching “Norm” Status – The Ultimate in Customer Service” back in March of 2005. For some reason, if there’s a business book related to Starbucks, I just have to pick it up and usually wind up going through it as quickly as one of my favorite mocha’s. This week I ran across The Starbucks Experience: 5 Principles for Turning Ordinary Into Extraordinary by Joseph Michelli. This book is the result of an 18 month study of what makes Starbucks work by the author. Starbucks has been one of those companies that completely fascinates me. From everything written about them, they are run a lot differently than most companies one reads about. Their commitment to their customers, employees, and communities in which they reside is really unparalleled in the business world and I am constantly wondering how they make it work. This book gives you some insight. In it, Michelli outlines the 5 principles that the Starbucks leadership team instills in its “partners” through tons of training and consistent modeling of behaviors by senior management. 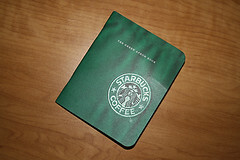 Make It Your Own – Starbucks goes to great lengths to educate their employees on their products. They also allow their employees (or “partners” as their called) to do whatever it takes to ensure a positive experience by the customer of the company. Each employee is encouraged to take action as if the company were his own. Everything Matters – Starbucks employees are trained to pay attention to the smallest details. Within this principle the author makes a distinction between “above deck” and “below deck” activities. The “below-deck” activities are those which the customer does not see. Great care is taken at Starbucks to pay attention to the “below-deck” activities. Traditional business find it “OK” to cut corners on below-deck activities to cut costs. Starbucks views these activities as just as important as customer facing ones. It is understood at Starbucks that in order to deliver quality, you have to deliver it at all levels of the business. Any compromises can relax “quality awareness” throughout the organization. Surprise and Delight – Cote actually addressed this principle fairly well in a recent posting where he talks about how companies can “unexpectedly delight him” by doing things he wouldn’t expect but are useful to him, the customer (see the “Making My Life Easier” section). At Starbucks, one of the primary principles the company is built on is cultivating this ability to delight customers and go beyond their expectations. The book gives some really good examples of this type of behavior. Embrace Resistance – This principle is all about accepting feedback, both positive and negative – and using the negative feedback to feed into the business to find lessons to improve. The company finds all feedback important. A recent example of this is its response to Oxfam America and its efforts to get Starbucks to use its leverage to stand up for the Ethopian Coffee Farmers. Rather than ignore the feedback, Starbucks responded – constructively and calmly, explaining its position on the issue. Accepting and responding to feedback is built into the core principles of the company. Leave Your Mark – The final Starbucks principle is built around being involved and contributing to the communities in which it resides. Starbucks has a strong commitment to contributing to the community around them. This chapter focuses on the social aspects of the company, including its activities concerning the environment and various social issues. To me, these seem like some pretty solid principles to build a business on. It almost seems “too ideal to be practically possible”. One thing that comes out fairly strong in most of the books I read about Starbucks (and Toyota as of late) is the acknowledgment of senior managements importance in setting the culture, ideals, and principles of the overall business while giving the “people doing the work” the ability to act within the framework of the principles. It seems that the more I read about these two companies, the more there is in common between them at a high level. A book that I would be really interested in reading would be a book focused on the IT practices and principles in both companies. It seems to me that it is really easy to push down authority in a company which is distributed across the country, while that same practice in a corporate environment (especially IT, which is traditionally looked at as a “necessary evil” and liability rather than an asset) would be a little harder to foster this type of culture. I would be extremely interested to read an honest, detailed descriptions of how these areas of the company are run within the context of the overarching principles. But here I go, digressing again. I thought The Starbucks Experience: 5 Principles for Turning Ordinary Into Extraordinary was an excellent book and would recommend it to anyone managing people. It documents an interesting framework for running a business and is full of great examples of each principle to illustrate application of the principle to “real life” in a business.